The Evington Wooden Gates are made in the UK from smooth planed Scandinavian Redwood, which has been pressure treated to protect against rot, mould and blue stain fungi for a long, low maintenance life. These wooden gates are available in sizes from 90cm to 360cm, giving you the option to use as a single pedestrian gate, a single driveway gate, or using two gates together with a throw-over latch, you can create a barrier across a wide entrance designed for larger vehicles. We will also deliver them straight to your front door, free of charge. 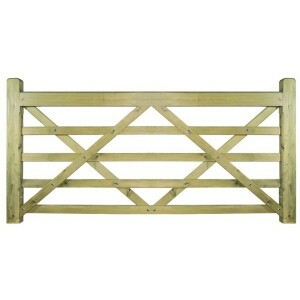 The Evington 5 Bar Field Gates are made in the UK from smooth planed Scandinavian Redwood that..